Getting There: Take Highway 6, turn left on Gore Road (signs for Concession 11), turn right at Concession Road 7, park at lot on right hand side. Species of Note: A murder of American Crows! Also, saw Eastern Bluebirds (rare winter sight) on a road a few miles from here. 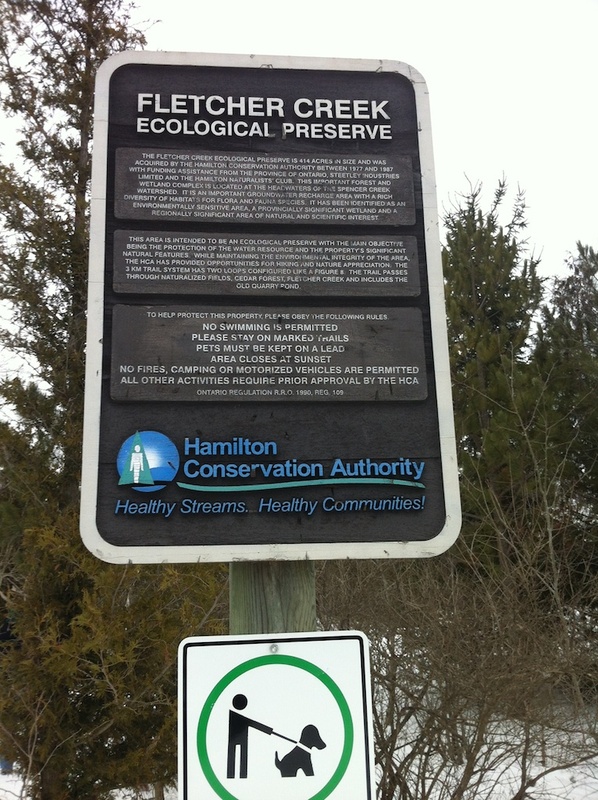 Obscurity Rating: 4/5 - Part of a major conservation authority (the HCA) but about as far away from downtown Hamilton as you can get and still be in the municipal bounds. Not many visitors out here! 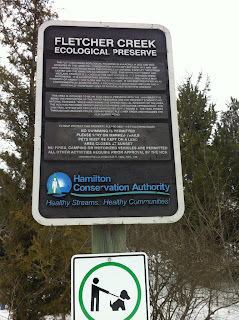 Today we actually embarked on two hikes -- one more of a wandering around of the University of Guelph Arboretum, searching for a Barred Owl that had been spotted there in our continuing quest to see an owl in the wild -- and the second at a conservation area I didn't even know existed, the Fletcher Creek Ecological Preserve. This preserve wasn't even on the maps (well, Google Maps) until I added it using mapmaker later that day. It's a former quarry site, and the main trail apparently leads down to the main quarry area that has become a new wetland. Unfortunately in our quest to see some more birds, and not knowing at the time how far the trail actually went, we walked only about half the trail and returned, walking fairly slowly trying to track down where a lot of finch-like chatter was coming from. We never did find out where the finches were, and it sounded like a pretty big flock! They must have been hiding deep in the woods. We did spot a few crows across the road in the distance, hanging out on a very old looking tree. It wasn't until we drove off that we noticed it was a full-fledged "murder" of crows -- about 35 or so -- hanging around the road, potentially scavenging roadkill. It may be that this flock of crows was keeping the finches in hiding. I'm looking forward to returning to this preserve someday, and finishing off this trail!